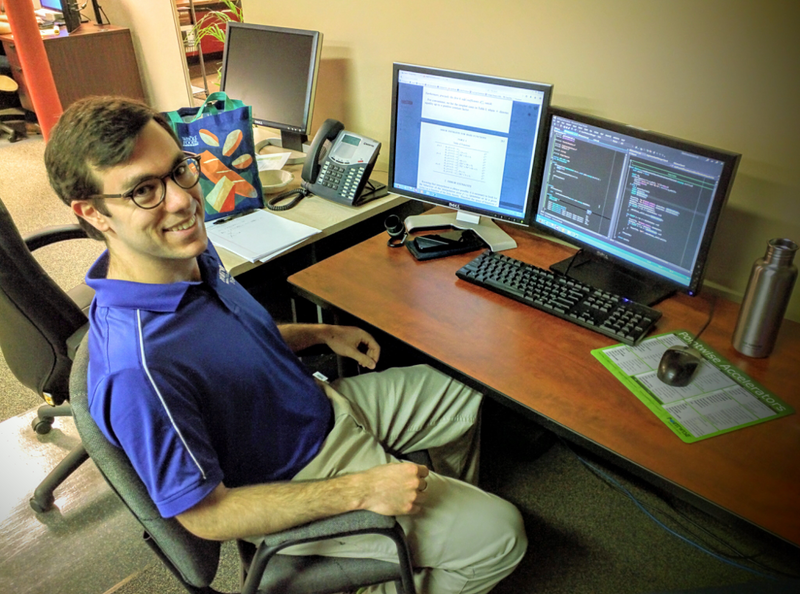 Philip Fackler, Intern on the Product Development Team. Being the son of a man who has served as a pastor and missionary in several places, there isn’t a place I would call my hometown. The closest thing would be Madisonville, KY. Thankfully, this is where I went to high school because there I met my wife (of 8 years), Amanda. And where she is will always be home. I have a B.A. in Mathematics from Asbury College (now University). I owe my initial interest in computational science (and CFD, specifically) to one of my professors there, Dr. David Coulliette. I finished my M.S. in Computational Engineering about a year and a half ago at the University of Tennessee at Chattanooga, where I am currently pursuing a PhD in the same field. My graduate research has focused on physics-based point placement for mesh generation using a “particle” dynamics simulation. Microsoft Visual Studio 2012 for C++ projects; (g)Vim for writing Glyph scripts; and Pointwise for testing and debugging…oh, and Firefox. I also use the Voxer and Google Hangouts apps (not at work) to talk to my wife who is back in Chattanooga, TN. I work downstairs in the development room within yelling-distance reach of all the fun and greatly talented people who write Pointwise and can point me in the right direction when I’m confused (which is the case more often than I would like to admit). Let me point out that the chair was my choice. I rarely sit comfortably in a chair that moves or has more than a small amount of padding. Most of the summer I’ve been updating or writing new CAE plugins for Pointwise (STAR-CCM+, Tecplot, Gridgen Generic, and PyFR so far). I’ve also written several Glyph scripts for carrying out useful operations in Pointwise that would be either very tedious or impossible from the user interface. Right now I’m beginning some research work on a prototype code for high order mesh elevation and smoothing. The goal is to see if using radial basis functions for mesh movement is an effective means of propagating boundary curvature into the mesh interior without resulting in any cell overlap. Point placement. I have very little experience making meshes by hand (I mean, using Pointwise), but my research as a student has focused on generating point distributions. What does it mean to have well-spaced points? And how can we generate such distributions? These are the types of questions my research considers. If you need some functionality that Pointwise doesn’t provide through the user interface, it’s likely very doable in a Glyph script. So write it yourself or put in a request for one. Watch this webcast to get introduced to Glyph scripting, and check out some great examples on the Pointwise GitHub page to see what’s possible and how it’s done. If you find yourself often repeating the same sequence of actions in Pointwise, let Pointwise write a script for you to do these steps automatically (Script > Begin Journaling…). See Help > Glyph Reference Manual. If you need Pointwise to export to a file format not already supported, write a plugin. David Garlisch has put a lot of work into making this task easy for anyone with experience in C or C++. Check out the webcast he recently made, and read the posts linked here, especially the two concerning the Pointwise grid model. Last semester (spring 2015), I took a second course on the finite element method. I knew at the start that the method’s theory is general enough to solve a wide variety of PDE-based problems and that the core logical steps are always the same for any dimensionality and problem type. So I took on the challenge throughout this course to write one code that could be used for all the project assignments given by providing “plug-and-play” problem definitions. I used a blend of inheritance and templating to express and take advantage of the genericity of the method and also minimize my use of dynamic polymorphism. It’s probably the most work I’ve ever done for a single course, and while a lot of it was unnecessary for the grade (I could have written a simpler code for each project) and the code will likely never get used, still being relatively new to the C++ way of doing things I was able to stretch myself and show myself a little more of what can be done. I rarely have a use for a CFD solver in my research. When I do, I just use a solver that I wrote. I mainly use VisIt for visualizing my point distributions (and flow solutions on occasion), and sometimes ParaView. I just finished the CFD Vision 2030 Study. Probably I’m late on this one, since it was published in 2014, but if you haven’t read it and you are involved with CFD in any fashion, it’s worth the girth ;-). I’m also studying up on radial basis functions for mesh movement (see 1 2 3 4). I attended the AIAA Aviation Forum two weeks ago. I have no further conferences planned for the rest of the year since I will be busy teaching my first class this fall (Introductory Statistics). I talk on the phone with my wife. I run. Amanda and I are beginning training (separately) for the Four Bridges Half Marathon in Chattanooga, TN, this October. I read theology books (currently The Messianic Hope by Michael Rydelnik and God’s Glory in Salvation through Judgment by James Hamilton). I also follow the development progress of the Gnome desktop environment and related Linux things primarily from WoGUE. “Point locations don’t need to be exact…it’s just meshes.” –Dr. Steve Karman, Jr. 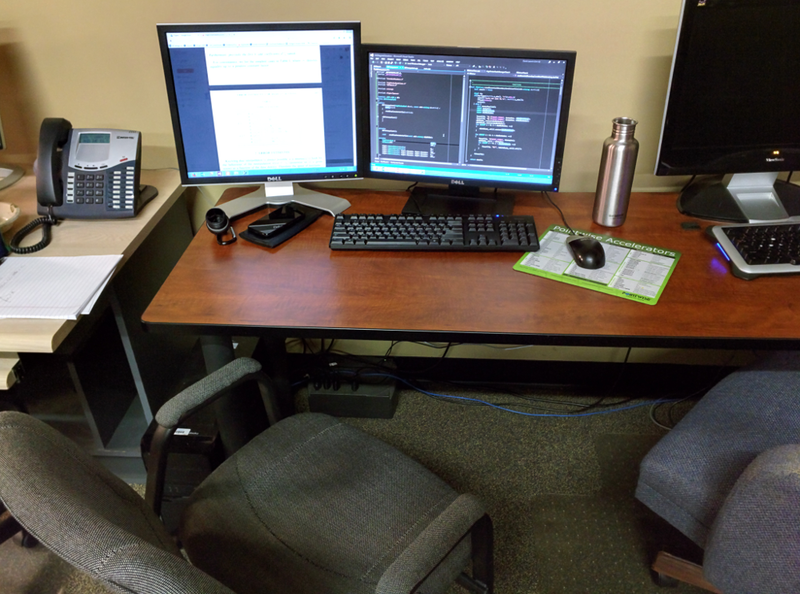 This entry was posted in People & Places and tagged AIAA Aviation, food, Glyph, higher order elements, interns, internship, ParaView, Plugin SDK, plugins, scripting, student, This Is How I Mesh, vim, VisIt, webcast, webinar. Bookmark the permalink.